Are you an Abuse Survivor? Have you thought about Suicide? Does life seem like a hopeless struggle? Do you help others heal? Suffering from a somatoform disorder (also known as a conversion disorder) in 1991, Don Shetterly was paralyzed and not able to walk or take care of himself. Traumatic moments of child abuse he lived through from an early age had finally caught up with him. At age 26, Don was set on a path that in order to survive and live, he had to heal those deep dark corners of his life. While this book is not a direct account of all that happened, the words here do form a picture of hope and possibility through trauma. Often when Don’s world was upside down and it seemed as if he could not make it, he turned to writing to help piece the moments of his life back together. These writings have come together into a book depicting the path of healing in his life. While it has not been an easy journey, Don wants others to know that no matter what you have been through in life, there is hope and possibility through trauma. Please click on the button to the left to read a portion of the book. It will give you an idea of how Hope And Possibility Through Trauma is written. 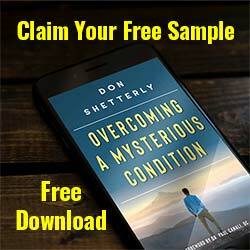 In 1991, Don Shetterly was paralyzed from a condition known as a “conversion disorder” for a short period of time. Since that time, he has spent many hours healing and recovering from the trauma and abuse he suffered as a child. Writing became therapy to Don and his book of poetry and writing, “A Journey Through Words” is about his own process in the journey to heal. One day, Don hopes to complete a book about the journey of his life which is a powerful story of triumph over insurmountable odds. In October 2010, Don released his first full length book, “Hope And Possibility Through Trauma”. While it is not a full account of all Don has been through, it does start out with his story. His hope with this book is that it helps people realize that no matter what you have been through, there is hope and possibility through trauma. Don is also the creator and writer for the Mind Body Thoughts blog, where he takes his experiences and applies them to our daily lives. The blog is about connecting the mind and the body together as one, pushing past all the things that hold us back in life. Don Shetterly is also a recording artist and pianist who creates relaxing piano music from the heart. The creations are all his own, and are created in the moment as if a conversation from the heavens was taking place. The music can be found on Amazon by searching under Don’s name. In addition, Don is a trauma therapist working to help others unlock the full potential in their minds and bodies. He has been doing massage-based body work since graduating from massage school in 2003, and now works closely with Dr. Paul Canali using the Unified Theory. It is out of all these experiences, that the writing of Don Shetterly finds its source. Not only it is a healing journey for him, but it is a work of inspiration to others. Please click on the button to the left to read the Table Of Contents from my book Hope And Possibility Through Trauma is written. 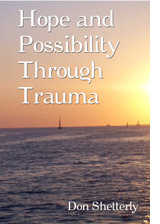 Please click on the button to the left for the Discussion Guide from my book Hope And Possibility Through Trauma.